As you can see very well here, in today's APOD, remarkable new details of Pluto's largest moon Charon are revealed in this wonderful Extra Detail Magnification (or "EDM", for short) that shows us the North Polar Regions of Charon itself - the original Contextual Picture was taken from the New Horizons' Long Range Reconnaissance Imager (or "LORRI", for short), late on July 13, 2015, from a distance of about 289.000 miles (such as approx. 465.099,26 Km) from the Surface of this - however - unusually-looking Celestial Body. 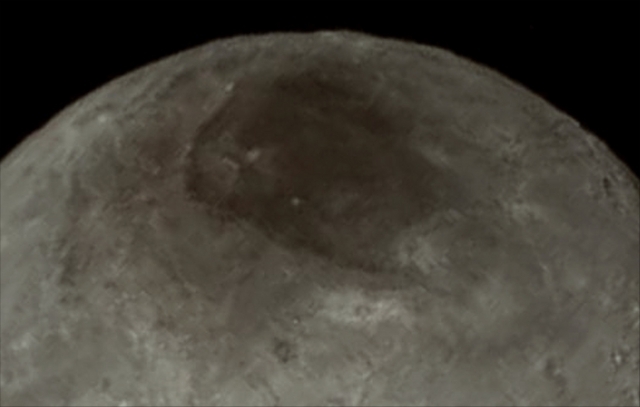 Generally speaking, the Mission Scientists are surprised by the apparent lack of Impact Craters on Charon. But, in particular, all over Charon's North Polar Regions (that is VERY WELL seen here), a dark marking - which was already prominent in the NASA - New Horizons Spacecraft' approach images - is now showing a diffuse (---> lighter in color) Boundary, suggesting that it could be a (thin?) Deposit of Dark Material (whose nature and origin are still - and, maybe, will remain - unknown). The image has been compressed to reduce its file size for transmission to Earth. In high-contrast areas of the original Contextual Image, Surface Features as small as about 3 miles (approx. 4,828 Km) across can be seen. Some lower-contrast detail is obscured by the compression of the image, which may make some areas appear smoother than they really are. The uncompressed version still resides in New Horizons' Computer Memory and is scheduled to be transmitted at a later date. Remember that the NASA - New Horizons Spacecraft traveled more than three billion miles over nine-and-a-half years to reach the Plutonian System. The image (which is a crop taken from an Original NASA - New Horizons Spacecraft's falsely colored and NON Map-Projected frame published on the NASA - Planetary Phojournal with the ID n. 19709) has been additionally processed, magnified to aid the visibility of the details, contrast enhanced and sharpened, Gamma corrected and then re-colorized (according to an educated guess carried out by Dr Paolo C. Fienga-LXTT-IPF) in Absolute Natural Colors (such as the colors that a normal human eye would actually perceive if someone were onboard the NASA - New Horizons Spacecraft and then looked ahead, towards the Plutonian moon Charon), by using an original technique created - and, in time, dramatically improved - by the Lunar Explorer Italia Team.